regen products are defined by their ability to break the cycle of mindless consumption and activate a new freedom - a bold articulation of exhilaration - in everyone who experiences them. Noribachi forges a fresh and fearless self-powered personal electronics division: regen. Today regen officially joins the clean energy landscape as the premier provider of hybrid grid/solar electronics. Today, the buzzwords of yore, “sustainable,” “eco-friendly” and “green” are mired in a crisis of cliched impotence. Appropriated by any and all, the eco-revolution has reached a saturation point - finally every last inch of the mainstream consumer landscape has been green-washed. Noribachi challenges the now meaningless bleat of sustainability by forging a fresh and fearless self-powered consumer electronics division: regen. Today regen officially joins the clean energy landscape as the premier provider of hybrid grid/solar electronics. 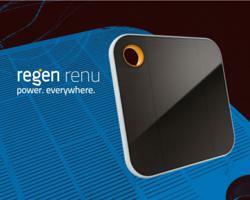 regen today launches the renu personal solar panel. Merging an ultra-efficient PV panel with a high-performance battery, renu charges electronic devices without ever connecting to the grid. Five hours of direct sunlight provides renu with enough energy to completely replenish an iPhone battery three times. renu’s simpler counterpart, the renu.s, retains all the power harvesting technology of renu except the battery, meaning that with renu.s devices charge in real time. Forthcoming products include the reverb, a free standing sculptural speaker with primal sound and the revu, the lodestar of lamps thriving as an objet d’art. with reverb and revu, light and sound are reinvented. the line forms here. speaking of lines, a limited number of renu first edition units are now available for purchase via invitation only. To request an invitation, visit regenliving.com. renu retails for $229; renu.s for $129. renu and renu.s are expected to be available for purchase in June 2011 through the regen website: regenliving.com.